The recent floods have opened up once again the maelstrom of a myriad of different agenda's. About which research or which ideas hold the greatest sway. Despite individual belief either for or against global warming, there are certain things that are not disputed. Sea levels are rising, weather patterns are changing, particulates in the air we breathe are an issue in towns and cities. Like the food web, a water catchment area is very complex ecosystem. A system that is very sensitive to even small changes. Each change no matter how insignificant at first sight can have unintended consequences further along the waterway. Erroneous decisions made in one area can have a significant detrimental effect in another. Part of the process of healing the flood meadow landscape means cleaning up the ecosystem and then protecting against contamination. By way of an example. Because village properties on flood plains can't normally be connected to the main sewerage systems. There is frequent use made of holding tanks. If an area is hit by flooding the contents will overspill and contaminate the watercourse and the surrounding land. Chemicals are often added to such containment to control smell. Those chemicals entering the waterway are a further source of contamination. Farmers hold quantities of slurry in lagoons or tanks which during heavy rainfall or flooding can over top and contaminate the watercourse and surrounding land. Therefore no process that would allow contamination in flood conditions should be allowed to take place on a floodplain. A floodplain or flood plain is an area of land adjacent to a stream or river that stretches from the banks of its channel to the base of the enclosing valley walls and experiences flooding during periods of high discharge. We are a tiny island nation and space is at a premium. However, brownfield sites should be prioritised. Rather than greenbelt land being allowed to change use. Stopping all building on a flood plane is out of the question. However, only essential construction should be allowed. Therefore a stringent set of rules around design and construction should be set to mitigate the effects of long periods of natural flooding. Flood plane or flood meadow should be managed for its primary purpose - to contain and absorb flood water. Secondary use providing grazing for animals should be encouraged. Where possible go along with nature - why enter into an expensive battle to protect the floodplain for arable farming. When the same results can be easily achieved elsewhere, on more suitable and acceptable ground conditions. There has been much angst and teeth grinding amongst the farmers on the Somerset levels. The government has offered them £10 million to 'rebuild' their farms. However, the farmers in an Alan Clark moment, have been a little bit "economical with the actualité" concerning the true scale of their problems. £3 million pounds a year is already provided to the farmers on the levels. Currently funding 528 'Environmental schemes' for more than 50,000 acres of the levels. Agreements where farmers are paid around £180 per acre to encourage habitat such as permanent grassland in flood plain areas. So that's a guaranteed £180 pounds a year per acre for keeping and eye on the grass. Whether the floodplain is flooded or not. How does this £180 an acre compare with other arable farmers across the UK. Well, figures from Churchgate Accountants (based on 59,000 arable acres) show the top 25%, achieved a healthy £185 per acre. The average paying circa £110 per acre. The bottom 25% made £50 per acre, according to the survey. Puts it all into perspective, it seems that those poor web footed farmers are all on the gravy train. The cost of affordable energy is a constant thorn in everyone's side. Thatchers government took what was a national asset and stripped it for cash. Now, the providers who were supposed to create competition seem to be all of one mind. The prices spiral ever upwards. Maybe its time for the government to look at state generation of electrical power. The options being large scale renewable, fossil, oil, gas and nuclear or a mixture of each. Governments and the generation of electricity are subjected to intense political lobbying by big business. The result of the delays this creates - is rather than replace dirty technology - Decision and construction now happen so late that it only supplements new demand. The predictable nature of tides makes them an ideal renewable energy source. Much more reliable than wind. The tidal range of the Severn Estuary makes it one of the great natural wonders of the world. We have all witnessed on TV the spectacular tidal bore which can be seen when the tide wind and river flow combine to create the right conditions. The barrage could be operated in the same way that the Thames barrier. Used just as a flood barrage it would certainly help to reduce the worst of the flooding that we have witnessed recently. However there are other issues that could make the barrage an even more attractive construction project such as power generation. 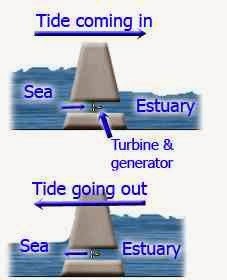 With two tides each day there is potential to capture renewable energy in the form of tidal flow in either direction. Giving reductions in greenhouse gas, through reduced CO2 emissions. The Severn Barrage would provide over 8,000 Megawatts of power. That's around twelve nuclear power station's. There are other sites that could provide electrical power through barrage generation. Between four and eight sites are to be found in Britain, potentially making the UK a key player in the World's Green Energy market. The Wash, Tees, Mersey, Severn, Dee, Solway and Humber estuaries are all potential sites for large scale tidal energy generating barrages. The Pentland Firth, the narrow run of water between the north-east tip of Scotland and the Orkney islands, is possibly the best place in the world to generate electricity from the movement of the tides. Scotland and the UK generally are seen as world leaders in tidal energy research, but it the United States and Canada who are investing heavily in the field. There are estimates that up to 40% of the UK's daily power requirements could be generated using tidal barrages. It is important that any development of renewable energy should be accompanied by a robust assessment of its environmental impacts. The assessment should also consider how any negative environmental impacts could be avoided or minimised, through the use of mitigating technology or regulatory safeguards. it is important that the quality and diversity of wildlife and natural features are maintained and enhanced. The range of options considered should be informed by consultation with the relevant nature conservation agencies. However, the concept of economic and habitat benefit in all its forms should be the major consideration. A major milestone is the funding available under the EU climate policy. The NER300 programme which has been described as a 'Robin Hood' mechanism. One that makes polluters pay for a new large-scale low-carbon technologies. The €1.2 billion of grants – paid by the polluters - will leverage a further €2 billion of investment for the 23 selected low-carbon projects. This will help the EU keep its front runner position on renewable energy creation. Two of these demonstrator projects will be in the in the UK. The EU has announced funding in the region of £30m for two UK tidal projects. Rhea Tidal Turbine Array has been given a €18 million award. The proposed development is for four tidal energy devices with the approximate electrical output of up to 5MW as an array in Kyle Rhea, located between the Isle of Skye and the Scottish mainland. Sound of Islay project has been given a €21 million award. The proposed tidal array is situated within the Sound of Islay which separates the Islands of Islay and Jura. The scheme will generate up to 10 MW of power from the tidal currents and will involve the construction and operation of ten tidal devices. MeyGen is planning to deploy tidal stream technology in the Pentland Firth that will initially generate up to 398MW of electricity, enough to power about 40,000 homes by 2020. It would be amongst the first array of tidal stream turbines. MeyGen has secured an Agreement for a lease from The Crown Estate for the area that lies in the channel between the island of Stroma and the north easterly tip of the Scottish mainland.